Because of the stresses and strains of modern living, we tend to tense up our shoulders and tighten our neck muscles more than is necessary. Because we do this so often, our muscles tighten further to assist in the upward movement of the rib cage, rather than being relaxed and allowing the breath to move into the abdomen. Your breathing thus becomes shallow, due to bad posture and tension, and then your tight and painful neck and shoulder muscles are deprived further of the oxygen they need. This causes even more tension and pain. It is no wonder that so many of us have sore necks and shoulders. 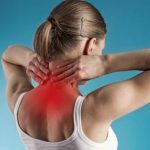 Here are some tips for chronic neck and shoulder pain relief. If you focus on your exhalation rather then the inhalation, you will reduce stress in a lot of places. Making sure that you exhale completely, you reduce carbon dioxide in your lungs, and this leaves space for more oxygen. Try to have exhale by speaking very quietly as well as counting up to ten over and over until you have run out of air. Never push air out by force, just exhale gently until the air is finished. Try this every time your neck and shoulders feel tight. You must feel the tension in your muscles in order to let go of it. Place your palm on the back of your neck and tighten your neck muscles by jutting your chin forwards. Hold for two seconds and then return your head to its normal position. Focus on the muscles that you have just tightened and lift the back of your head off your shoulders. Focus your attention on the tight muscles and say to yourself, ‘I allow my neck to be soft and free.’ The muscles there will release. Repeat this process each morning and evening. Lie down on an exercise mat or thick carpet and place between one and three inches of support under your head. You could use paper back books. Make sure your chin and forehead are in line and this will force the neck and shoulders to relax. Bend your knees up onto a chair and rest your calves on the seat of the chair. If necessary, place some cushions under your knees. Bend your elbows and place your hands on your ribs. If you have a lot of tension between your shoulder blades, lie with your arms crossed over your chest. This posture is great for relieving pain and getting rid of tension. Try and do this for about fifteen minutes a day. Think affirmative thoughts like ‘I allow my shoulders and chest to be soft and wide. Visualize your shoulders being open and wide and your chest opening. Lift your shoulders up and let them flop down without pushing them down. There is very little effort involved for this one, but these are great for relieving neck and shoulder pain if you have been sitting for a long time. With some thought to your body and different ways of doing things to ease the stress and tension out of it, you will make yourself a lot more comfortable over the long run.